So as you can probably imagine, we love the coffeefruit. We are constantly innovating processes to convert this once discarded coffee byproduct into an even better super ingredient. In fact, we think of it as our super-secret superfruit. 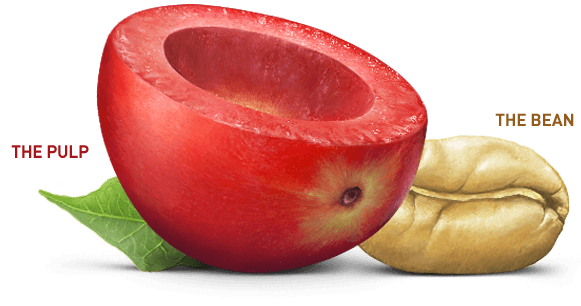 Maybe by now you’re like, “okay, but where has this superfruit been hiding?” Well, we like our coffeefruit like we like our Spring Break—exotic. So we get ours from Indonesia, land of lush green fields and bright, tropical skies. Bai’s purchasing and use of the coffeefruit supports long-term economic opportunities for coffee producers in remote, relatively poor regions. We have met and forged relationships with the hardworking men and women who’ve nurtured coffee production for generations. Now, each crop of coffeefruit — and bottle of Bai — represents a brighter future for the coffee families of Indonesia. Our use of the coffeefruit’s outside also lessens some botanical waste from streams and soil in coffee-growing regions. This helps strengthen the land and lives of the people and species that co-exist there. Bai beverages are powered by a “secret superfruit” —a.k.a. the coffeefruit— which includes the fruit surrounding the coffee bean. What makes it so “secret?” The fact that the coffeefruit’s outside is an ingredient that, until recently, had not been widely used in beverages found on your favorite stores’ shelves. Most Bai beverages are also an excellent source of antioxidant Vitamin C. Vitamin C is needed for the growth and repair of tissues in all parts of your body. Like the pulp of the coffeefruit, the white tea extract in most of our beverages also has polyphenols. I keep hearing about antioxidants — what are they? Antioxidants are organic substances found in foods and beverages that are capable of combating damage to the body’s cells that occurs through the process of oxidation. The coffeefruit used in Bai beverages has antioxidants, as do many other popular foods and beverages — from fruits and vegetables such as blueberries, pomegranates, carrots and tomatoes, to beverages such as green and black tea, to sweet and savory treats such as chocolate and nuts. What is oxidation and why is it bad? Oxidation is a normal, regularly occurring chemical process that produces highly unstable and potentially dangerous molecules called free radicals. Everyday factors and activities — such as diet, pollution, smoking, exercising, stress or anxiety — can speed up the process of oxidation. Broadly speaking, oxidation is the interaction between oxygen molecules and all the different substances they may contact. In many instances, oxidation can be destructive — think about how rust can damage the body of a car, or how a piece of fruit left out on the kitchen counter too long can turn brown and rotten. Oxidation has a similar effect inside your body. More precisely, oxidation is defined as the loss of at least one electron when two or more substances interact — this is where free radicals come into play. What are these free radicals? Free radicals created through the process of oxidation are molecular fragments that are short one electron. Every human being is constantly creating free radicals simply by living and breathing. If free radicals are so common, what’s the problem? The formation of free radicals is a natural bodily process, and they can play a positive role in many normal cellular processes. But at highly concentrated levels, they can be dangerous — potentially causing extensive damage to all parts of cells, including DNA, proteins and cell membranes. Because they contain at least one unpaired electron in their outermost shell and they want to complete themselves, free radicals combine with healthy cell membranes or DNA to steal their missing electron. This scavenging process sets off a chain reaction that can damage healthy cells and weaken the body’s immune system. The body does have natural ways of delaying or inhibiting the oxidation process through its own defense system of primary antioxidants. Examples of primary antioxidants include enzymes called SOD (superoxide dismutase), glutathione peroxidase and catalase. But those alone are not completely effective in thwarting free radicals. Plus, the body’s power to fight free radicals diminishes with age. This is why the consumption of antioxidants is so important. Antioxidants are effective in battling free radicals in two ways. They can be sacrificial warriors, giving up their own electrons to free radicals. When a free radical gains the electron from an antioxidant, it no longer needs to attack the cell and swipe electrons from membrane fatty acids, mitochondria or DNA. This valiant effort helps break the chain reaction of oxidation. Antioxidants also can go on the offensive and break down the free radical molecule, inhibiting its ability to attack cells. So, is this where diet comes in? Maintaining a diet of antioxidant-rich fruits, vegetables, spices and other plant-based foods and beverages is an important part of living a healthy lifestyle. In addition to the body’s naturally occurring defenses, secondary antioxidants consumed through dietary sources deliver another wave of defense against oxidation and free radicals. Is there any concern about consuming too many antioxidants? In addition to their naturally occurring form in foods and beverages, antioxidants can be found in man-made form in dietary supplements such as pills. Health experts do not recommend simply replacing a healthy diet of antioxidant-rich foods and beverages with dietary supplements. Such supplements can interact adversely with certain medicines. And high doses of antioxidant supplements have been found to be harmful in some cases. Medical experts and nutritionists caution consumers against overconsumption of antioxidant supplements — and their advice is similar to what Moms and Dads have been telling their children forever: Eat your (super) fruits and vegetables! Why is it important to consume foods and beverages that are rich in antioxidants? The answer lies in the combination of “smart sweeteners” — erythritol and stevia leaf extract— used in each flavor of Bai. What is Bai Proprietary Sweetener Blend made from? Bai Proprietary Sweetener Blend contains two ingredients: erythritol and stevia leaf extract. Stevia leaf extract is born from the sweet leaves of the stevia plant, which is a member of the chrysanthemum family. To extract the plant’s intense natural sweetness, stevia leaves are harvested and dried. The leaves are then steeped in hot water. The resulting liquid extract is filtered, purified, and dried, resulting in the crystalized stevia leaf extract. Over 200 times sweeter than sugar, stevia leaf extract is an important sweetening ingredient in Bai Proprietary Sweetener Blend, and only a tiny amount is needed to deliver its clean sweet taste. Is it true that there’s only a small amount of stevia leaf extract in Bai Proprietary Sweetener Blend? Yes. Stevia leaf extract is more than 200 times sweeter than sugar so only a small amount is needed. Why is Bai Proprietary Sweetener Blend less than 1% stevia? Stevia leaf extract is a high intensity sweetener and this means that a tiny bit of stevia leaf extract goes a long way. Erythritol is an ingredient in Bai Proprietary Sweetener Blend used to evenly disperse the intense sweetness of stevia leaf extract. Erythritol is necessary to provide an “even” sweetness level throughout the product. Is Bai Proprietary Sweetener Blend and stevia leaf extract the same thing? No. Bai Proprietary Sweetener Blend contains two ingredients: erythritol and stevia leaf extract. Stevia leaf extract is the common or usual ingredient name for the extract derived from the leaf of the stevia plant. Stevia leaf extract is the primary sweetening ingredient in Bai Proprietary Sweetener Blend. What is erythritol and why does Bai Proprietary Sweetener Blend contain erythritol? What is Erythritol? Naturally found erythritol is a sugar alcohol made from simple sugars derived from plant starches. It looks and tastes like table sugar, though it is about 30% less sweet. It was discovered in 1848 by Scotsman John Stenhouse. Erythritol is the largest ingredient in Bai Proprietary Sweetener Blend by weight, and is used as an ingredient to provide bulk and the sugar-like crystalline appearance and texture in Bai Proprietary Sweetener Blend. The erythritol used in Bai Proprietary Sweetener Blend is produced through a natural fermentation process. Fermentation is the process by which an organism metabolizes or “digests” one or more food sources to produce a desired product. Fermentation occurs naturally in a variety of different foods given the right conditions and is used to produce wine, beer and yogurt. In the case of erythritol, a natural yeast digests the simple sugars such as dextrose and other nutrients and produces erythritol. After fermentation, the erythritol is filtered and dried into crystals. Erythritol is small; found naturally in a variety of fruits, such as grapes and pears, as well as in mushrooms, and certain fermented foods such as soy sauce and wine. Do major public health organizations support the use of Erythritol? The major part of erythritol goes into the body through the bloodstream, after being absorbed via the small intestine. The major difference between erythritol and other sweeteners is that it doesn’t have any laxative effects in normal quantities, which are common in other sugar alcohols. The main reason behind this is that more than 90% of erythritol is absorbed before entering the large intestine. Your body fully absorbs erythritol but can’t break it down, so it provides (virtually) no calories and does not produce a glycemic response. Most erythritol is absorbed into your bloodstream in the small intestine, and then for the most part excreted unchanged in your urine. Is it true that the stevia leaf extract and erythritol in Bai Proprietary Sweetener Blend are highly processed or made with toxic chemicals? As with almost all finished food products, the journey from field to table involves some processing. The sweet components of the stevia leaf need to be extracted from the leaf, like vanilla needs to be extracted from vanilla beans. The erythritol in Bai Proprietary Sweetener Blend is made from a natural fermentation process. Like in other finished foods, including table sugar, processing aids suitable for use in food are used in the production of both stevia leaf extract and erythritol. These aids help either extract, isolate or purify components of the ingredients. Under the U.S. Food and Drug Administration regulations, our processing aids are not subject to labeling requirements because they do not have a technical or functional effect in the finished food and because they are either not present or are present at insignificant levels in the finished product. Why doesn’t Bai Proprietary Sweetener Blend use erythritol sourced directly from fruit? Decisions on where we source erythritol from are based on technologies and raw material availability. The erythritol we use is produced by fermentation and is the same as similar to the erythritol found naturally in a variety of fruits, such as grapes and pears. Registered dietitian of the free weight-management and healthy-living website SparkPeople.com, America’s largest diet and fitness website by unique monthly visitors.